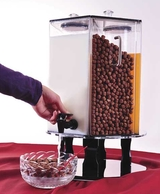 This Hotel Cereal and Juice Dispenser is perfect for those busy people on the move. You can have two convenient dispensers in one place with this dual canister. Serve cereal in one side with the milk on the other. This is the perfect addition to a hotel breakfast buffet. 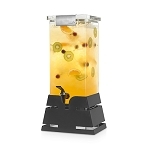 Your guests are going to love how easy this double dispenser is to use, even the younger crowd can serve themselves. Save money and increase your customer volume, plus no need to refill as often. Hurry, order your super saving cereal dispenser at All Candy Containers.